Epiphytic plant with short stem, completely enclosed by imbricating leaf-sheaths. Roots many, fleshy, flexuous, glabrous. Leaves flrshy, pendant, elliptic or obovate, apex round or obtuse, often unequally bilobate, long of more than 18 cm, broad 6 cm. Flower stalk thin, more or less as long than the foliage. Rachis in zigzag, few flowered. Bracts triangular-ovate, concave, acute, of 4 mm. Flower from 4 to 5 cm with well spread out segments. Oblong-elliptic, acute or obtuse sepal dorsal, dorsally carinate, mucronate. Lateral sepals similar to the dorsal sepal, slightly broader. 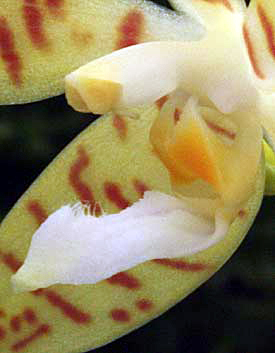 Petals identical to the dorsal sepal, a little smaller. Lip 3-lobed, shorter than the petals. 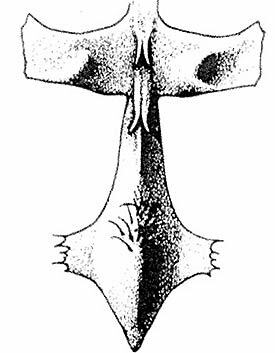 Lateral lobes oblong-ligulate with truncated apex, provided in their middle of a callus in shape of half moon. Midlobe at narrow base, ovate, obtuse, irregularly notched at apex. Presence of a membranous median keel continuing with a hairy zone then by a callus glabrous and fleshy at apex. Disc between midlobes provided of a pair of callus bifides superimposed. The former callus being located at the junction of the midlobe and lateral lobes. Column slightly arcuate, fleshy, widened at base, long 8 mm. Flowering begins in summer to continue lengthily in autumn. The color varies lemon-yellow to yellow greenish and yellow corn. Sepals and petals marked of transverse lines and spots brown/red or cinnamon. White lip with a yellow or yellow/orange callus on the lateral lobes. He grow since the sea level until an altitude of 450 meters. 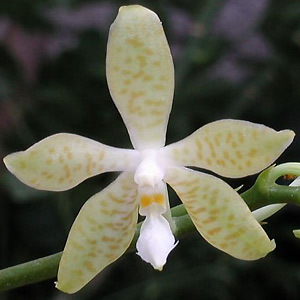 In spite of its facility of culture, Phalaenopsis pallens remains rare in collections. 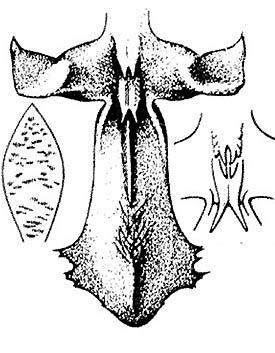 The first description with an erroneous name of genus is given by Lindley who start from a badly preserved specimen. First Phalaenopsis pallens to be flowered in Europe did it in the greenhouses of the Duke of Devonshire in 1849. Some additional words from Rolfe in the Orchid Review N°152 august 1905. 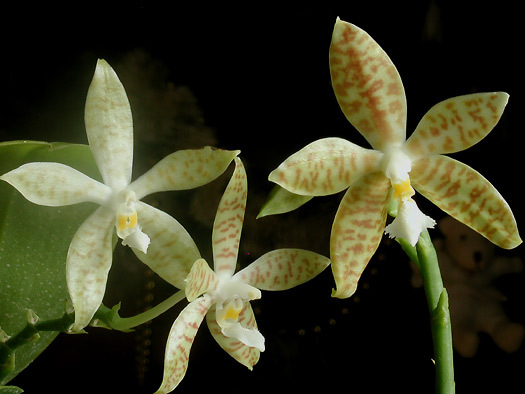 See also Phal.denticulata on the same page and Phal.foestermanii two pages later. Some years before, in november 1900 and in the same review, an other article from rolfe, speak also about Phalaenopsis pallens. Characterized especially by the absence of pronounced marks on the segments. White/cream, and especially, one distinguishes 2 to 3 mauve parallel lines on each side of the central peak of the midlobe. 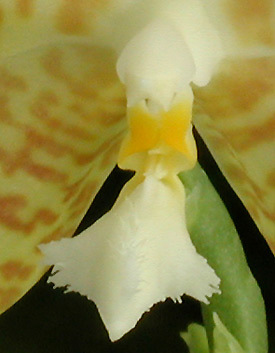 Broader floral segments, and lip with the midlobe very clearly in shape of trowel.